Modern shower tile designs come in a wide variety of sizes, colors, and shapes. They are also offered in different materials ranging from ceramics to glass. Natural stone is another popular option. 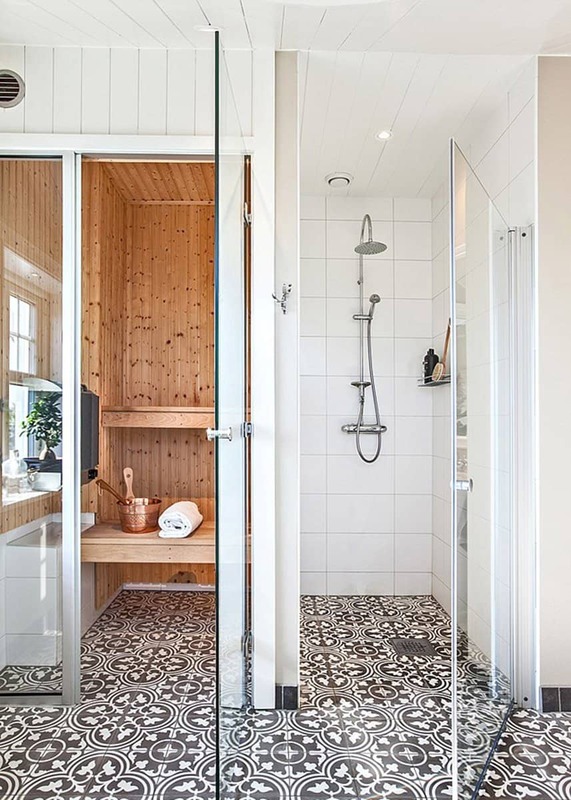 It can be difficult to choose one type of tile, but the beauty of a walk-in shower is that you can mix and match designs. You could choose one type of tiles for the walls and another for the floors. 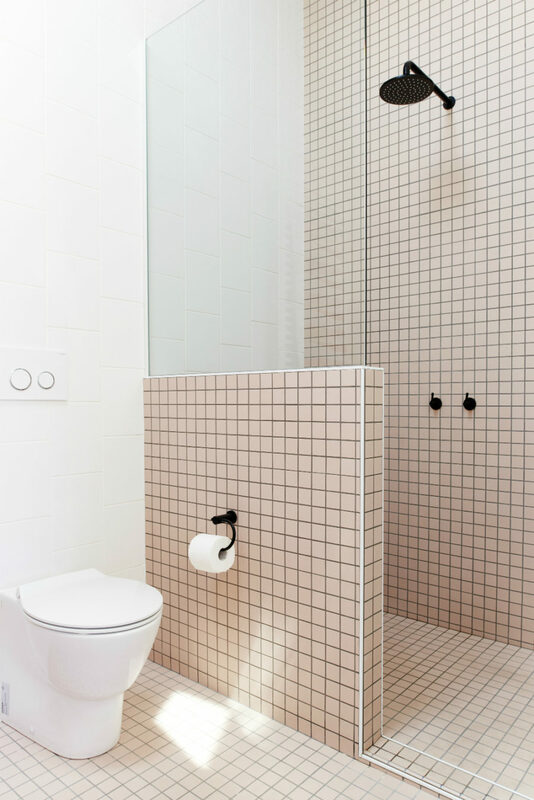 Or you could make your shower stall stand out by covering its wall with printed tiles. Options are endless and you can create a look that really speaks to your tastes. The beauty of any tiles is that they are easy to maintain and installation process is relatively similar for each type. There are, of course, some things you’d want to consider like material maintenance but from now on it’s all about aesthetics. 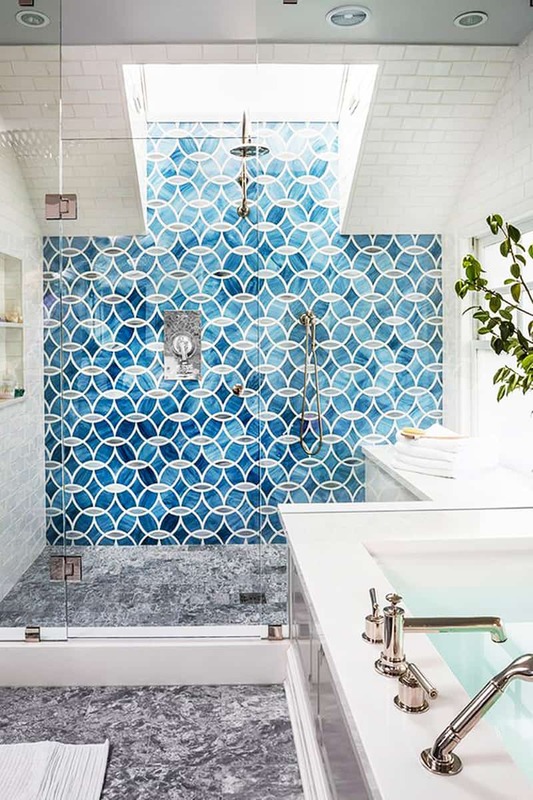 Glass is a fairly unpopular shower tile material (compared to ceramics), but it can make for a unique look. 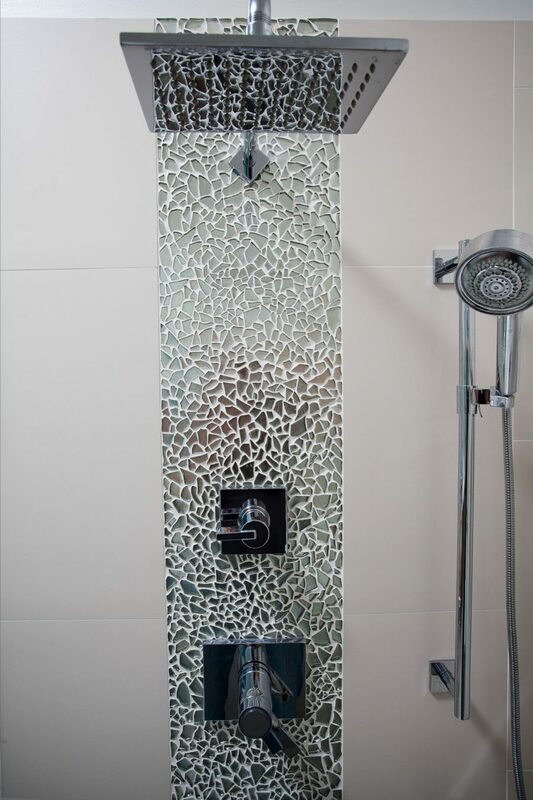 Usually showers feature a glass stall and ceramic or stone tiles, but here the two were merged into one, which made for a gorgeous result. 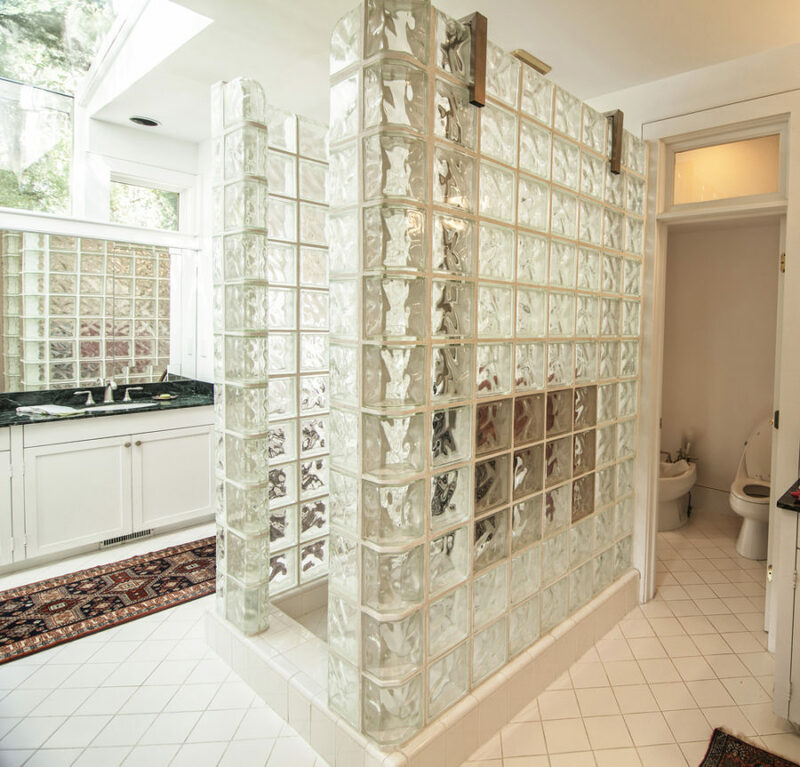 The thick glass tiles add privacy to the shower stall aside from giving it an unusual look. It’s better to use these for walls because they can be too slippery in flooring. 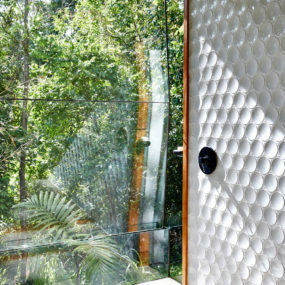 Glass tiles come with different finishes. 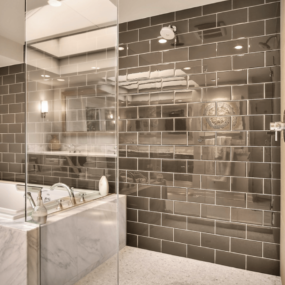 These mirrored tiles are of beautiful platinum color and have a reflective finish. 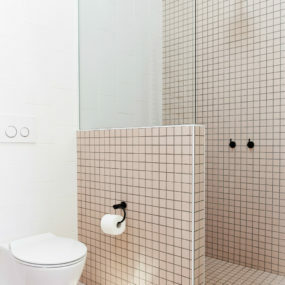 This is a great way to visually enhance a small bathroom and shower. 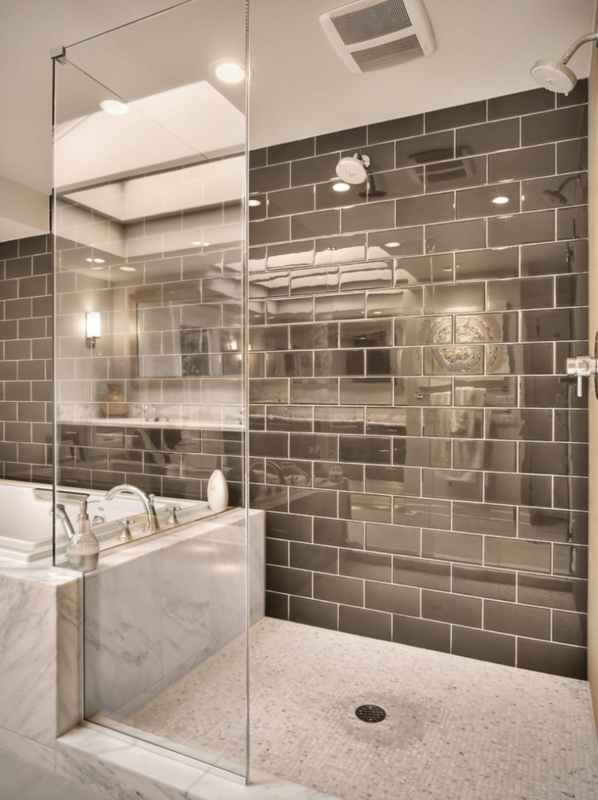 Reflective tiles may require cleaning more often, but they bring a modern and unexpected look to the room. 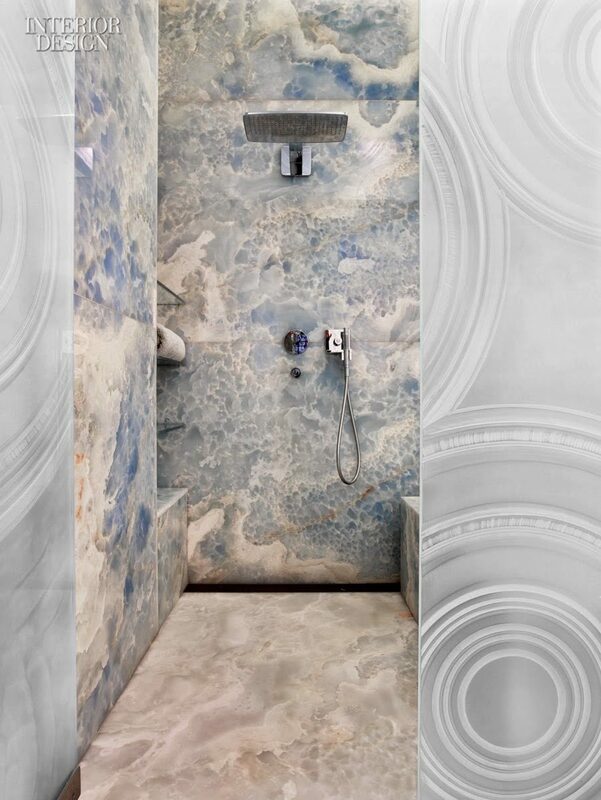 Natural stone like marble or slate is often used to produce shower and bathroom tiles. Onyx is more expensive and rare but like marble makes for a luxurious look. In fact, onyx brings a lot more color and detail to the interior. 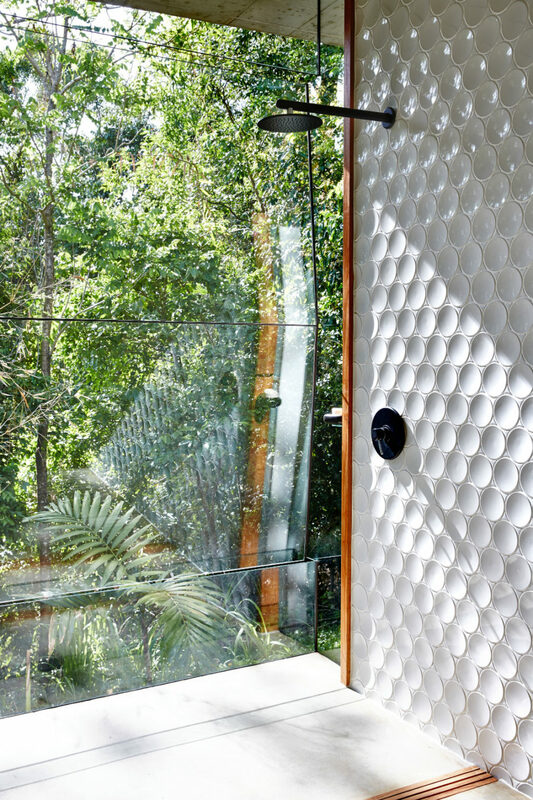 Since onyx offers more complex patterns, it can be used to create a feature shower wall. There are, of course, simpler variations of the stone pattern that can be used to cover most of the bath’s surfaces, if desired. Marble tile makes for a classy look. It is reliably beautiful, even breathtaking and it almost never disappoints visually. Though, it is more expensive than regular tiles and requires more maintenance. If you think that all marble looks the same, there are many subtle differences between stones and if you want something different you can find red, green, or purple marble. Pebbles are something else when it comes to shower tile designs. They offer a very interesting look, if incorporated the right way. On the floor they give the shower a pleasant tactile feel. Sometimes pebbles can look dated, old-fashioned or even unattractive. But this usually happens when the design mixes too many different patterns and colors. 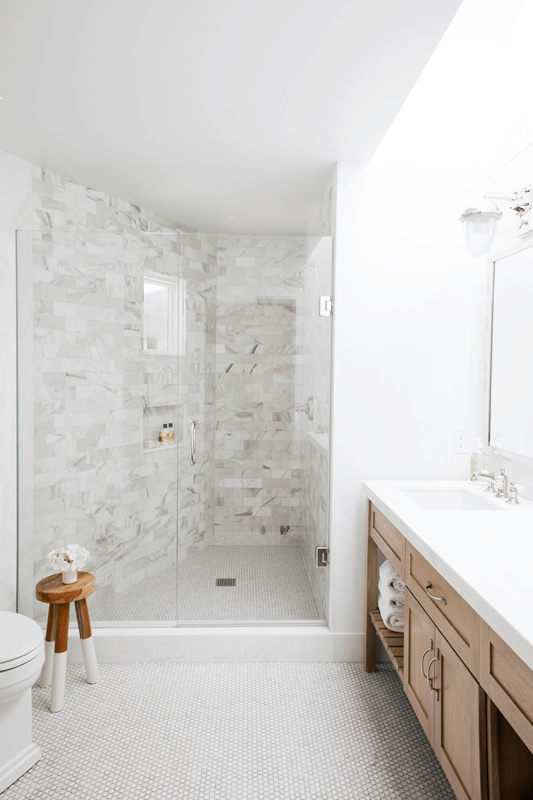 Here the light-colored pebbles are accentuated with simple downsized subway tiles. 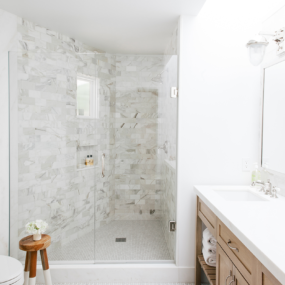 The resulting look is clean and light, which fits beautifully with the size of the bathroom. 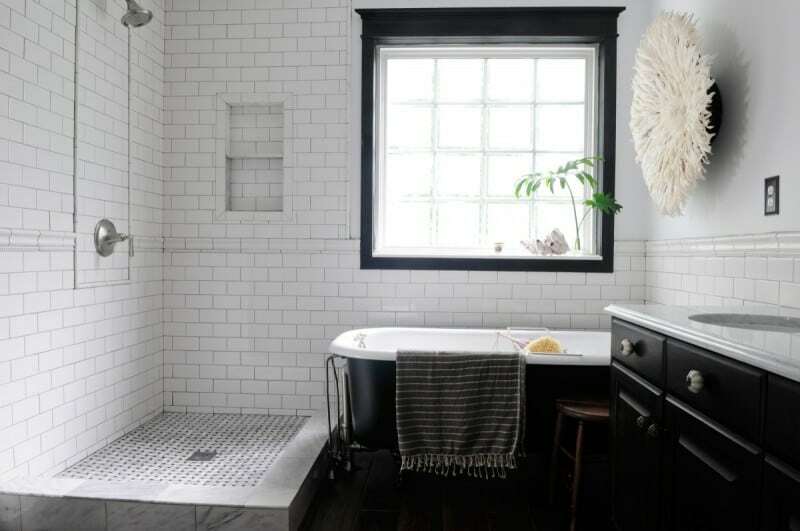 Subway tiles are what they call while these rectangular tiles you can find in so many bathrooms and showers. They are affordable and easy to install. Surprisingly, these can look both dated and ultra modern, depending on what you do with them. And boy, can you do a lot with these plain, at first sight unattractive tiles. Arrange them in patterns or mix with printed ceramic tiles, pair them with glass and combine them with black furnishings – they will look great. 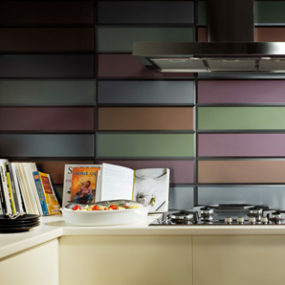 Herringbone is one of the patterns that you can create with simple rectangular or subway tiles. There are also other patterns to be made with creative tile positioning. Hexagonal tiles too become more and more popular these days. They provide an interesting alternative to traditional rectangular and square tile shapes and also come in various sizes and colors. 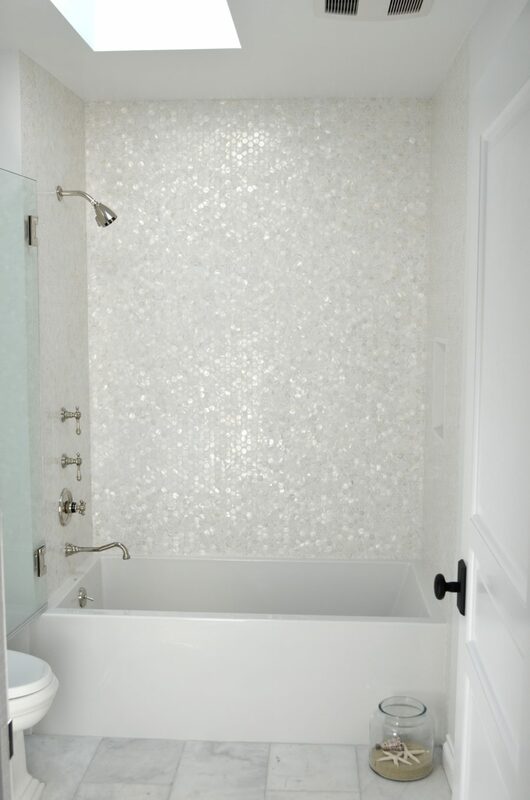 For instance, these beautiful mother of pearl hexagon tiles create a fish scale effect in this white shower. This is a great way to decorate a plain white interior and give it a bit of dimension. The small scale of these hexagon tiles makes for a very gentle look that isn’t typical of tiled surfaces. It is also a great type for decorative backsplashes. Speaking of fish scales, there are tiles that are shaped just like them. 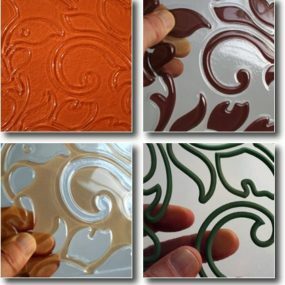 Used in a shower wall or in entire bathroom they will definitely give your interior a unique appearance and feel. 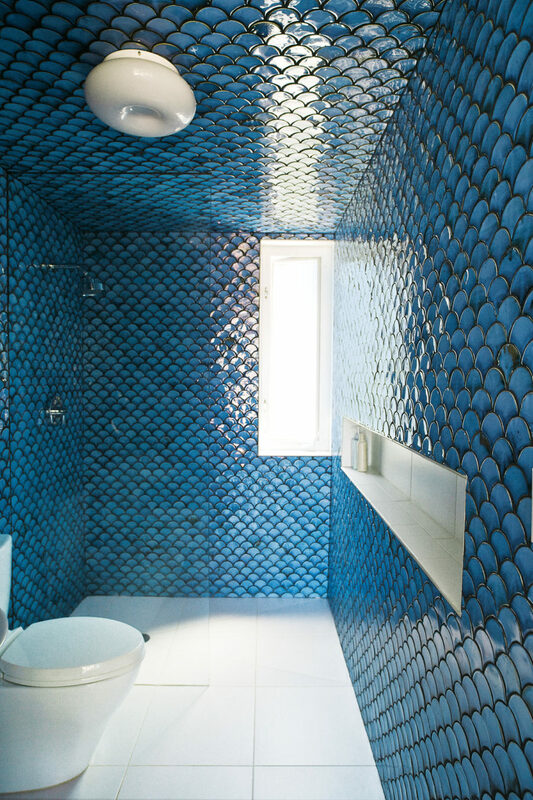 Fish scale tiles are available in a wide variety of colors and while for many blue and green would be the first color choice, there is fun to be had with different hues as well. Try mixing and matching a few and see how it turns out. Mosaic tiles come in various shapes and forms. They aren’t just big-scaled puzzles. 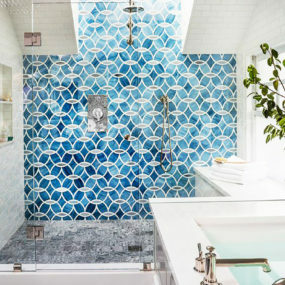 There are many different mosaic shapes that will give your bathroom a completely different look. Rectangular tiles may be more affordable but mosaic tiles are as easy to work with. 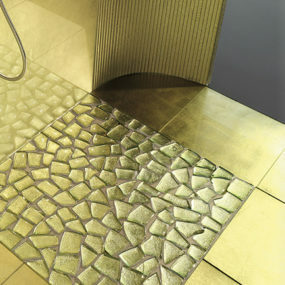 Speaking of mosaics, crushed stone and glass tiles can offer a completely unique pattern. 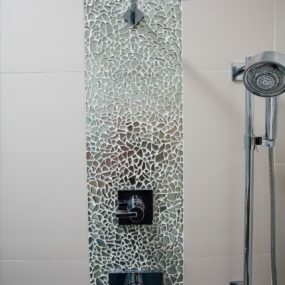 This backsplash is a strip of crushed mirror shards that give this modern stylish shower an eye-catchy accent. This is a great way to save on new tiles, by the way. Anything can go into it. Think old mirrors, old tiles, or ceramics. 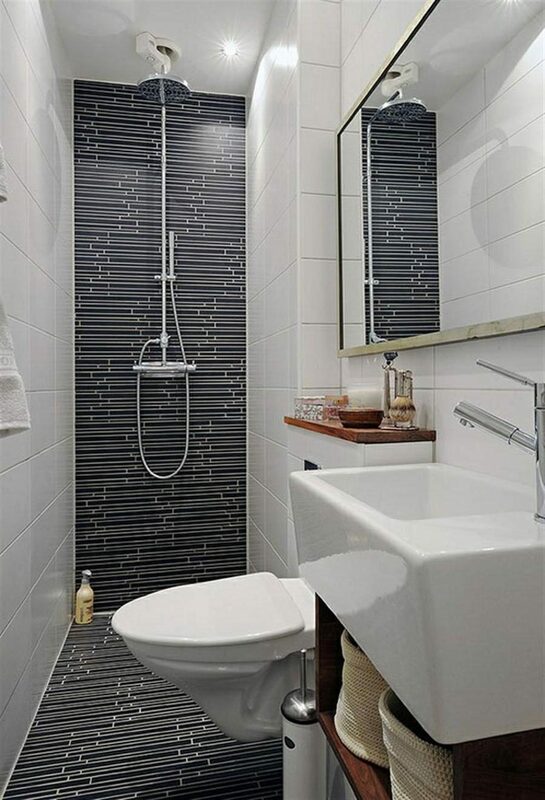 Thin rectangular tile strips are great if you want to get away from your average bathroom look. Installing these can be both a creative and a technical process. Cutting them randomly (or relatively so) can create a certain pattern. Paired with more traditional tiles these make for an unusual accent in the shower. Good old square tiles can actually give your shower an unexpectedly fresh look. It, of course, depends on their size and color. These are from High House by Dan Gayfer Design. They come in a smaller size and a fresh shade of pink. 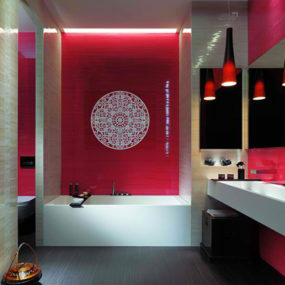 When it comes to shower tile colors it’s hard to beat blue in popularity but quartz pink definitely makes an impact. 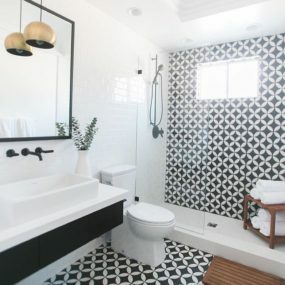 Do not underestimate the power of a simple black and white tile combination, though. There are so many stylish designs to be created with just these two colors. 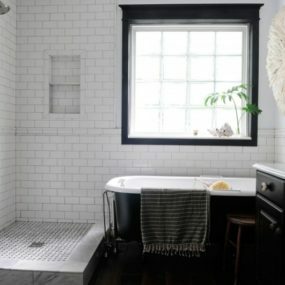 From the zebra outline like in this shower stall to the many great designs on Pinterest, black and white is a cheap way to a unique interior. 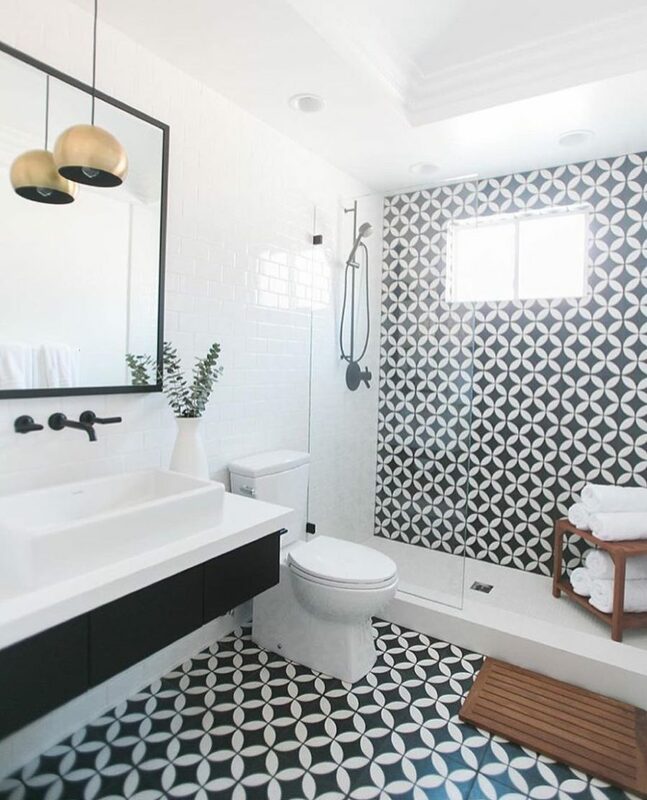 Differently-shaped tiles like hexagons and fish scales would contrast nicely in black and white. Shower tiles don’t have to always be just white or cream, however. 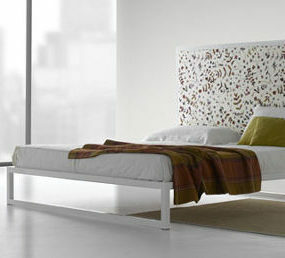 Modern options are so full of color, why not use them to liven up the first place you visit in the morning? 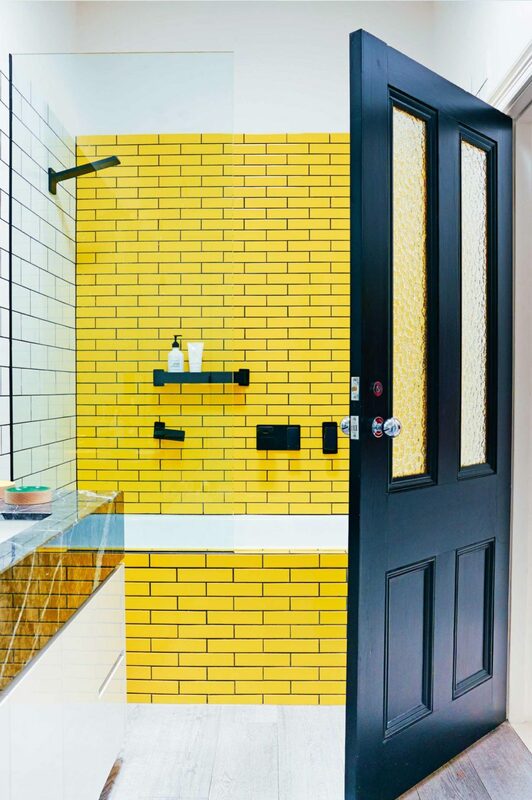 Such bright tiles make a great contrast with neutral whites and blacks. The stylish faucets and accessories in this design take it even further and complement the look. 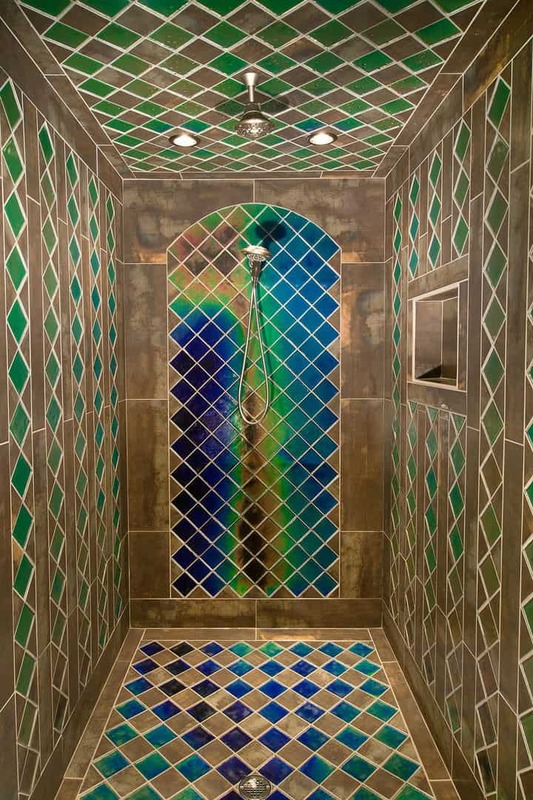 Heat sensitive tiles are definitely a thing and while you may only see the heat signatures while taking a shower, they can look great as they are. These come in different colors, but the hot water and the heat from your body will leave temporary markers on them. Fun and unusual! 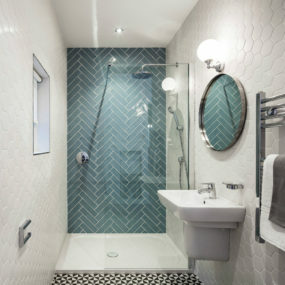 Patterned tiles are the easiest way to decorate your bathroom. Choose the right colors and the pattern you like and most importantly decide on location. A shower wall makes for an obvious first choice. It also makes sense if you only have a shower bath. 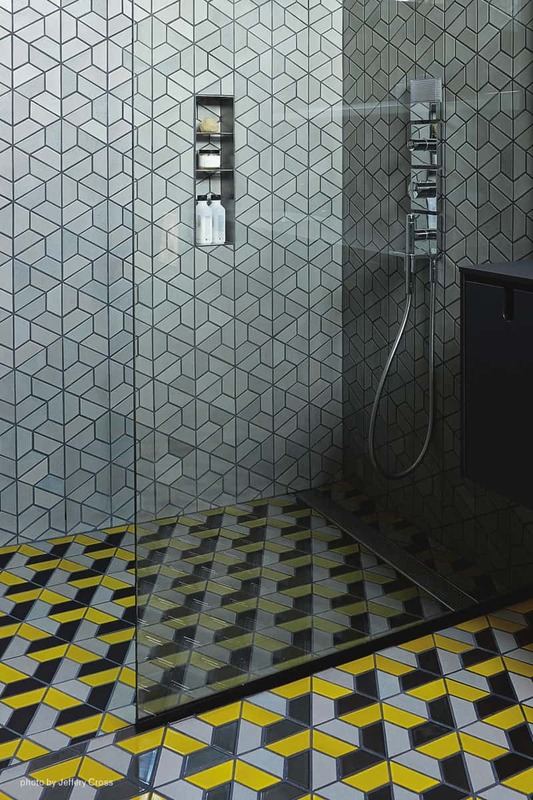 The patterned tiles will accentuate it and allow it to stand out in the interior. 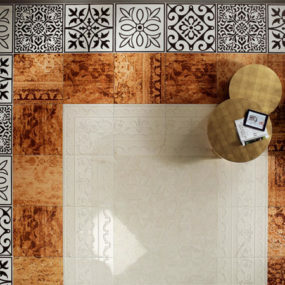 Floors are another great location for your patterned tiles. 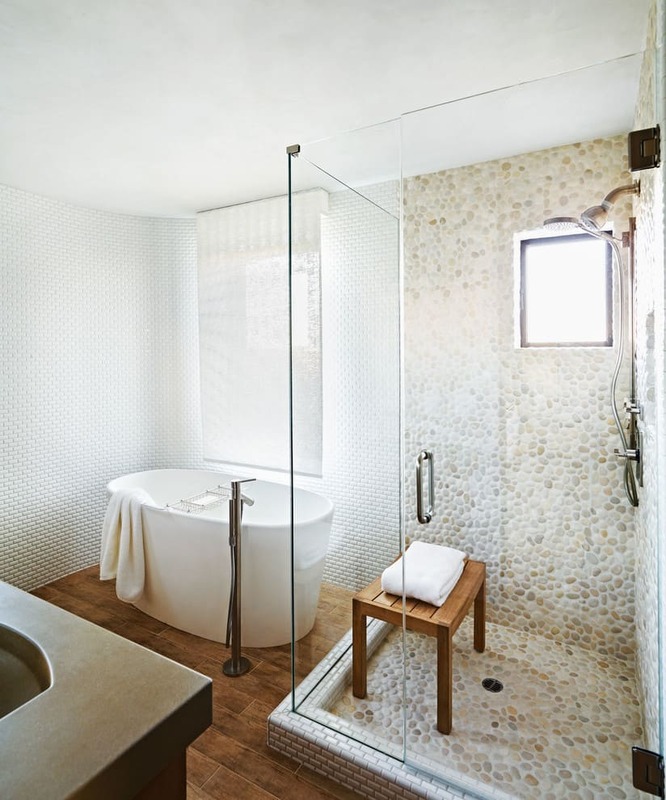 You can cover both the shower wall and floors with them to create a focus in the bath. Here the pattern colors are also used in the rest of the interior with wooden and metallic accents softening the look. Patterned tile floors give the monochromatic interior a much needed accent, but the plain walls also make it easier on the eyes. The pattern isn’t easy to ignore, but the fact that it’s somewhere down below makes the bath appear lighter. A great thing about these is that their seams are virtually invisible, which turns them into a continuous repetition of pattern. 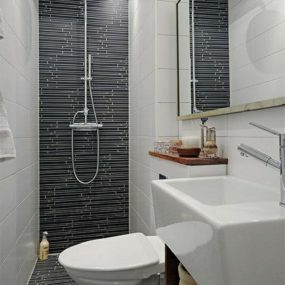 Easy to install pattern tiles bring dynamic to the bathroom interior. Finally, this list wouldn’t be complete without textured or as they call them 3D tiles. 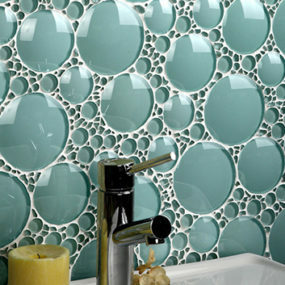 These are great because they do not just provide your shower wall with texture, but they also vary vastly in shapes. There are wave-shaped 3D tiles, round and triangular ones. They protrude from the wall to make it irregular and interesting. 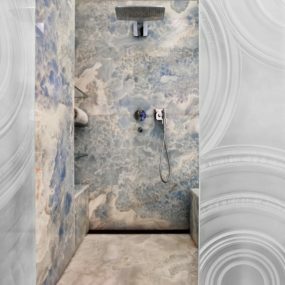 In these you can find the patterns you wouldn’t encounter in other types of shower tile designs. And while they may be challenging to clean, the look is definitely worth it. 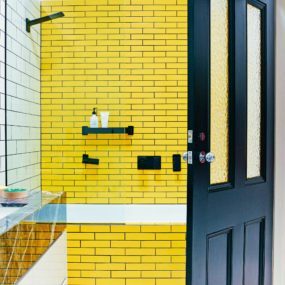 Shower tile designs aren’t limited just by their size or shape. 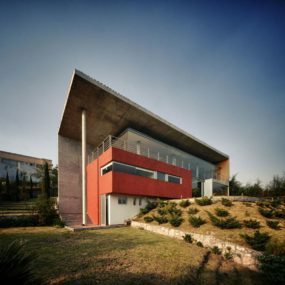 Combinations of colors, patterns, and shapes are endless and the way they are used and installed plays a big role in design as well.